Seeking healthcare IT-related tips, updates and inspiration? Download our free eBook and discover how top healthcare IT influencers use Twitter for social selling and information sharing. This is a must-read for HIT industry executives, technologists and marketers who want to learn Twitter best practices from peers who are actively engaged on social media. 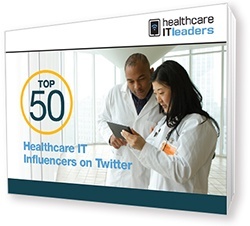 Start learning more about healthcare IT today when you follow these 50 Healthcare IT Influencers on Twitter!